This set is typical of what B&O were producing in the closing years of their use of valves in radio sets. Despite appearances, this is not a stereo model, both loudspeakers are connected together and to a single common amplifier. A version with only one loudspeaker, the Mini 610K, was also available. Text copyright © Beocentral. Unauthorised reproduction prohibited. 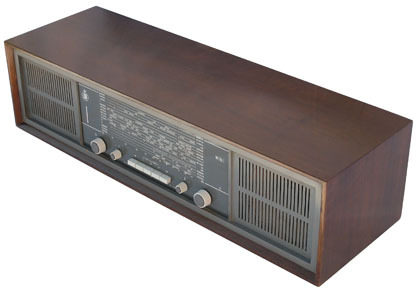 The basic receiver circuit of this set was very similar to the much larger and more expensive Grand Prix 610, although refinements such as automatic frequency control (AFC) for FM, an adjustable ferrite rod antenna for MW and LW and push-pull output were not included. The “magic eye” tuning indicator was retained however and despite its modest position in the range this model was capable of very pleasing performance, helped in no small part by the excellent Philips dual-cone loudspeakers that were used. Text copyright © Beocentral. Unauthorised reproduction prohibited. A record player and a tape recorder could be connected but although the DIN sockets used would accommodate stereo equipment all recordings and reproduction would of course have been in mono. If a B&O record player was to be used a type with a built-in preamplifier, such as the 42VF, would be needed. Text copyright © Beocentral. Unauthorised reproduction prohibited. The Mini 610K and Mini Deluxe 610K were both replaced by the new transistorised models that became available during the following few years. The mono Beomaster 700 was the nearest directly equivalent model. Text copyright © Beocentral. Unauthorised reproduction prohibited.